The June 2010 HOMBRE trip to the Dominican Republic came to an end almost two weeks ago, as the team arrived back home in the wee hours of June 13th. It is always difficult when these trips end–spending so much time in such close quarters with dedicated and determined people leaves a deep impression and makes it hard as everyone goes their separate ways for the summer. This trip was much more peaceful than last year’s: no attempted robberies, no threats of violence. We stayed in a new hotel, found new places to each and to pass the time, and (hopefully) provided positive influences on the careers of 11 medical, pharmacy and pre-medical students. The team was willing to try new ideas, and I think we have some good ideas for future projects in terms of medical supplies and medication purchases, and in terms of teaching students clinical skills in challenging conditions. We had a Dominican doctor working with us for 4 days, and a colleague joined her for the second half of the project. All told, we provided care to nearly 600 patients and dental fluoride treatments to nearly 300 children. I’ll update the website with some additional photos, but I’m pasting the team’s photo below. Thanks for all the hard work! Our VCU School of Pharmacy student HOMBRE participants are posting on a blog during this trip: check out http://blog.vcu.edu/pharmacyhombre/ to see what their thoughts are. Today we completed our first 4 days of clinical work with the HOMBRE team. We spent these days working in Villa Mella, our usual work site, and found it as hot, sweaty, frustrating and rewarding as usual. The Dominican Republic is an amazing country, and one where I always have to recalibrate my expectations. It’s reasonable to be delayed for nearly 2 hours on the first day of work because a sudden torrential rainstorm flooded major streets up to the buses’ axles and inundated sidewalks and businesses. Our rendezvous with Anny, a Dominican physician helping the team, was an event constantly shifting in time, location and punctuality. The patients in the clinic were alternately grateful and insistent. This is all surrounded by the noises and music and smells and sights of a vibrant and colorful capital city. It’s always amazing that things get accomplished. But they do. We arrived safely on Tuesday and, aside from a suitcase forgotten in the hustle to get through the airport in the DR and recovered later that night, had uneventful travels on the way here. Pill counting went quickly and was made much easier by the fact that we purchased the majority of our medications here in-country. This made for an easier time making the necessary preparations, and the medicines were already waiting for us at the hotel at our arrival. The HOMBRE team has no veterans of this site. We have 7 medical students, 2 pharmacy students, and 2 “civilians” (one rising college junior and one student’s fiance) and although some of them have worked overseas in other sites, none were familiar with the DR or with Paraiso. Despite this, the team has come together in remarkable fashion: everyone pulling their weight and taking care of necessary tasks and requirements, even when not the most glamorous. Students have taken histories and vital signs, have examined patients and helped formulate treatment plans, and have written and filled prescriptions. Seema, our pharmacy director, has organized a pharmacy from scratch and figured out the best way to make it work. Sravi, this year’s community health directory, secured fluoride donations and took the lead in providing dental services for Paraiso’s children. And Todd, the overall student leader, has kept everyone and everything moving forward–a difficult task when the group had never worked together before this week. And so the first 4 days are over. We provided care to approximately 300 patients in the clinic and saw another 30-45 on housecalls the last 3 days. We have recontacted our friends in Paraiso and continued the work to improve the community’s health and well being through honest and equal partnerships with the community members. Tomorrow is a day off for the team, well-deserved. 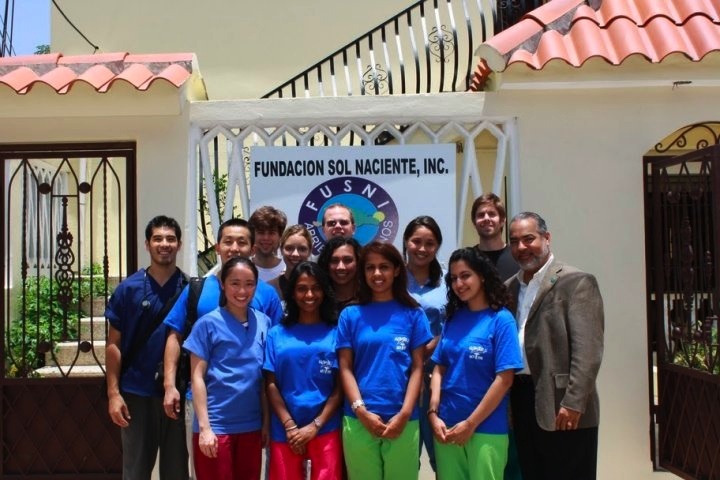 On Tuesday we shift our work site to Dr. Ramon Lopez’s Fundacion Sol Naciente health center. This center provides medical services at minimal cost for a different marginalized community, and provides needed medications for free. Although we do not have the same depth of community commitment in this site, working with Dr. Ramon allows us to provide care to patients who otherwise would lack access and provide support to a valued community partner.